Flange gaskets are used in various industries, including Chemical Processing, Pharmaceutical, Hydro-Electric, Oil and Gas, and Medical. 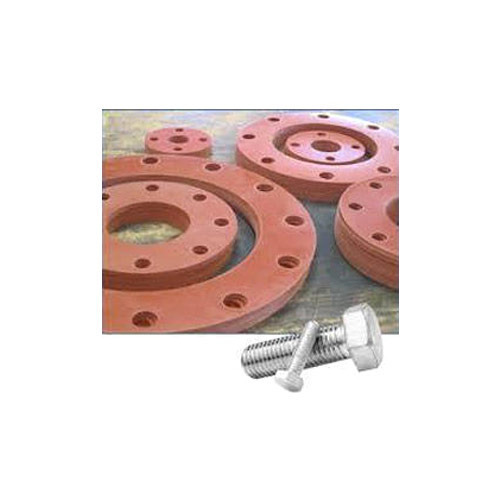 Standard Pipe Flange Gaskets are SBR Rubber (a.k.a. Red Rubber), but Neoprene, EPDM, Buna N, Silicone, Viton (Fluoroelastomer), and other rubber compounds are also readily available. Gasket thicknesses between 1/16" and 3/8" are readily available in most materials; standard hardness options include 40 through 80 durometer (Shore A). In its simplest form, a flange gasket is used to join or fit between two sections of pipe; each pipe section typically has a flared area that provides a surface for the gasket to attach to. Types of flange gaskets include ring gaskets and full face gaskets. A ring gasket is a gasket with an inner diameter (ID) and outer diameter (OD); a full face flange gasket is similar to a ring gasket, with bolt holes (aligned in a bolt circle) in the surface area between the ID and OD. Both ring gaskets and full face gaskets come in metric and standard sizes, and in various thicknesses. With the help of our skilled professionals, we are capable in offering a wide array of Rubber Flange Gasket. The offered gasket is manufactured using optimum quality material that we source from authorized vendors of the market. A team of experts examine this gasket on variegated parameters of quality, before the final delivery. In order to fulfill the diverse needs of our clients, we offer this gasket in various sizes and specifications. Looking for “RUBBER FLANGE GASKET”?